After planning consent has been secured, there may be a requirement for archaeological mitigation works to offset the impact of development. The extent of archaeological mitigation required by a local authority will vary depending on the character of the archaeology present. 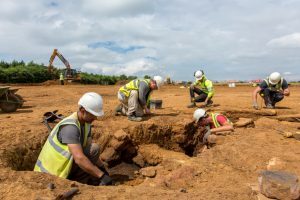 Cotswold Archaeology’s skilled and experienced team deal regularly with the full range of archaeological mitigation works. We pride ourselves on our ability to deliver results on schedule, provide regular and informed client communication and consultation with respect for any confidentiality requirements, and a professional and impartial approach to ensure the cost-effective discharge of planning obligations. We work closely with developers and contractors to ensure efficient programming of attendance to reduce costs and avoid delays to construction programmes. Excavation involves detailed investigation on sites that are known to be significant. Excavations follow a carefully researched Written Scheme of Investigation agreed with the local planning authority. This sets out the aims of the project and the methods to be used to record the archaeological remains. The results of the work are then analysed and a detailed report prepared. Watching brief conditions are regularly attached to planning consents, especially where it is thought that archaeological remains of limited or unknown importance might exist. An archaeologist will be needed to monitor intrusive groundworks, site stripping or demolition works requiring foundation removal on site. As with excavation, the results of the work will need to be analysed and a report produced. Preservation in situ is sometimes necessary to safeguard particularly significant archaeological remains. Cotswold Archaeology can provide advice on foundation engineering techniques or design modifications so that impact on archaeology is avoided, whilst minimising effects on the design or viability of the development. This is particularly common on developments that fall partly or wholly within Scheduled Ancient Monuments, where early involvement and advice from one of our experienced archaeological consultants is vital.